Tata X451 Premium Hatchback – All You Need to Know! Tata Motors, India’s popular passenger car and UV manufacturer, plans to launch a handful new car models in the coming years. One of these upcoming Tata cars in India is a premium hatchback to rival the likes of Maruti Baleno and Hyundai Elite i20. Internally known as the X451, this hatchback has finally entered the testing phase. It is likely to be present at the Auto Expo 2018 in a pre-production guise. You can see the latest spy images of the upcoming Tata X451 hatchback on this page. Prices are likely to start a little north of Rs 5 lakh. The X451 looks all set to become the company’s most premium hatchback till date. It will borrow in plenty from the Nexon, which is only a good thing. Even the design would have a lot of Nexon in it, which means the new car could look like a more premium sibling of the Bolt. On the inside, the interior panels will have a very modern design. Like its compact SUV sibling, it will have a dashboard-mounted touchscreen infotainment unit. Engine options will include 1.2-litre Turbo petrol and 1.5-litre Turbo Diesel units. Both the engines will come mated to 6-speed manual transmissions as standard. The two motors are also likely to get optional AMT automatics. The engines will output 110 PS. They will offer a good mix of performance and fuel mileage. The upcoming Tata hatchback car will sit above the Tiago-Tigor duo and closer to the Nexon hatchback in the company’s product portfolio. The new model will even spawn out a mid-size sedan to rival the Maruti Ciaz and the Honda City. 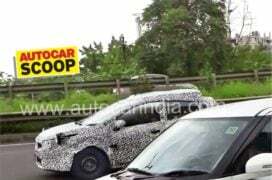 The upcoming hatchback was recently spotted road testing in Pune. 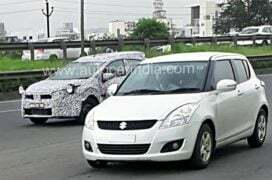 As you can see in the spy images we have here, the car was caught along with a Maruti Suzuki Swift, which the company could have been using for benchmarking purposes. You can find out all the available details on the new Tata X451 in our post here. 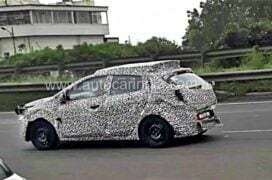 Well, nothing is official at the moment but we do expect to meet a pre-production version of this hatchback at the Auto Expo 2018. We await an official word on the launch date. However, there are good chances that the new car will launch by the next festive season. This means we are still about a year away from having the new premium hatchback on sale. Given that the upcoming new Tata X451 hatchback will launch in late 2018, we have enough time to gather more information regarding the launch date and prices of this car. The X451 will be a really important product for the company. It’s almost for sure that the new model will pack a punch under the hood, will have an eye-catchy design and will pack tons of new features. That said, only time will tell if the car will be able to give a hard time to the likes of Hyundai Elite i20, Maruti Suzuki Baleno Rs and others. The upcoming car will be positioned in the ultra-competitive B2-segment. It will compete mainly with the Maruti Baleno and the Hyundai Elite i20. Also, the above spy images show the company testing its new product alongside the Swift. This means the new car could even rival the high-end variants of the Swift. Prices are likely to start at roughly Rs 5 lakh and go all the way to around Rs 9 lakh for the top-trim with a Diesel engine and AMT. The new model will find itself positioned close to the Nexon compact SUV in the company’s product portfolio for Indian car market. While there many uncertainties involving the launch date and price of the Tata X451 hatchback, it looks really very probable that the new model will share its engines with the Nexon compact SUV. This means that the hatchback will have two engine options- Petrol and Diesel. Both these engines wlll be turbocharged units that will offer a good mix of performance and mileage. The Petrol engine for the Nexon displaces 1.2-litres and outputs 108 BHP along with a peak torque of 170 Nm. On the other hand, the Diesel version displaces 1.5-litres and also outputs 108 BHP, but has a peak torque of 260 Nm. Both these engines come mated to a 6-speed manual transmission. However, the upcoming hatchback can even have an AMT for both the engines. As the engines come from the Nexon, even the mileage won’t be too different from what the compact SUV offers. Safely expect the petrol engine variant to have an average mileage of roughly 17 kmpl. On the other hand, the Diesel engine variant will offer a mileage of up to 21.5 kmpl. True, this won’t make the new X451 the best mileage hatchback in its price segment but the motors will offer a really good mix of power and average mileage. Even the AMT versions will offer a similar mileage. This will be because of their fuel-efficient nature. AMTs, unlike torque converter automatics, aren’t fuel-sapping units. The upcoming premium hatchback from Tata will come with an all-new design that will be based on the company’s IMPACT design language. New Tata cars like the Tigor and the Hexa are based on this design language and look really attractive. Even the X451 will, in all probability, will be quite a head-turner. The upcoming new car will feature stretched-back headlamps with projector elements, a wide grille connecting the two headlamps and have the ‘humanity line’, low-mounted fog lights with integrated LED daytime running light elements, a low-slung profile and a fresh rear fascia. Even the interior will be as modern and as attractive as the exterior. We are almost sure that the company will make use of high-quality materials to lend the cabin a very premium feel. This will ensure that the slightly more upmarket clientele won’t think twice before putting its money on a Tata. The company has pretty much failed in the premium hatchback with products like the Vista, and more recently, the Bolt. With the X451, things might change for the good. So what do you think about the upcoming new Tata X451 hatchback that will launch within a year? 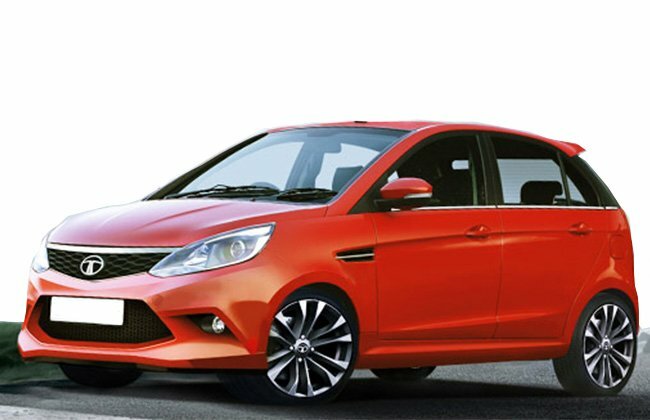 What do you think should be the price of this upcoming new car from Tata Motors? Do let us know by penning your thoughts in the comments section below. Keep following Car Blog India for the latest news on cars and motorcycles in India.